Spending the last few days of the year and welcoming in the days to come in Japan is a rewarding experience, in more ways than one. The new year, known as shogatsu or oshogatsu to locals, is one of the most important holidays celebrated in the land of the rising sun, if not the most. There are numerous traditions surrounding the occasion, all of which provide foreign travelers bits and pieces of the Japanese culture. However, most New Year festivities and practices in Japan last a bit longer than the day itself. In fact, foreign visitors may get a little frustrated with regards to the schedule of several tourist attractions and to the crowds of people going from one place to the next. Osoji means “big cleaning” in English. This refers to the practice of cleaning the entire house before the New Year arrives. Almost all families living in Japan observe this tradition, seeing it as a way to create stronger bonds with each other. As such, tourists can expect most of Japan’s cities, even the busy city of Tokyo, to be nearly empty and quiet on omisoka. Joya no Kane is a tradition that stems from Buddhism, one of Japan’s religions. It is considered to be among the most important practices observed by Buddhist temples. Near midnight, these temples ring their bells for around 1-2 hours. Since almost every neighborhood in Japan has its own temple, tourists can expect to hear these bells on omisoka. Interestingly, the bell ringing done by temples actually follows a certain count. This reflects the Buddhist belief that humans have 108 earthly desires called Bonnou that keep them from reaching enlightenment. To help in removing every last Bonnou, each temple monotonously strikes their bell 108 times. Ganjitsu or gantan are both used to refer to New Year’s Day but actually point to different periods of the day. Gantan refers just to the morning hours of New Year’s Day, while ganjitsu refers to all 24 hours. However, many locals may also not be aware of this small difference so using the terms interchangeably is fine. Right after having breakfast, many families have a busy schedule for the rest of New Year’s Day. 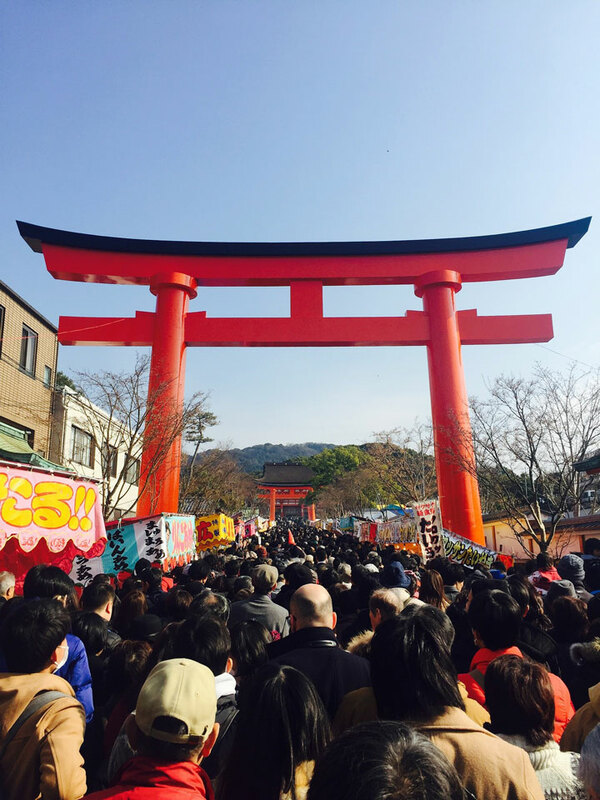 Common activities and traditions include visiting shrines and temples, shopping, eating, drinking, and greeting other people with “Akemashite Omedeto Gozaimasu”, which means “Happy New Year”. As previously mentioned, shogatsu is an important Japan holiday that extends beyond January 1. There are many traditions which start as early as the last week of December and go until the end the first week of January observed by the Japanese community. Toshikoshi Soba refers to the local tradition of eating Japanese noodles, or soba, during New Year’s Eve that dates back to the Edo Period. Soba is created by stretching and cutting dough to form long and thin strings. This process represents the cutting away of the old year’s misfortunes to create a long, healthy life ahead. Kadomatsu refers to the green decoration often present by the entrance of Japanese homes and offices. According to local belief, the kadomatsu serves as a temporary house for the year god known as the Toshigami-sama. They believe that having a kadomatsu will attract the Toshigami-sama into their property and bless it, as well as those in it, with a fruitful year ahead. The decoration is made out of bamboo, ume (plum), and pine trees which represent longevity, prosperity, and strength, respectively. Some choose to keep the kadomatsu on display from the day after Christmas all the way to the seventh day of January. Kagami Mochi refers to a rice cake decoration that many shrines, schools, and homes put on display to wish for prosperity for generations to come. Although known as the mirror rice cake, it actually does not resemble any of the square or geometric mirrors that are known by many, today. It does, however, resemble ancient round mirrors that served important roles in Shinto rituals. According to the religion, kami, or gods, resided in these mirrors. As a way to welcome in the New Year with the kami, rice cakes were created in the form of these mirrors. At present, Kagami mochis come in different varieties. Most of these come with an orange on top that represents the generations of a household. The Kagami mochi is often placed on top of a wooden cabinet for several days before it is broken and eaten on the 2nd Saturday or Sunday of January. 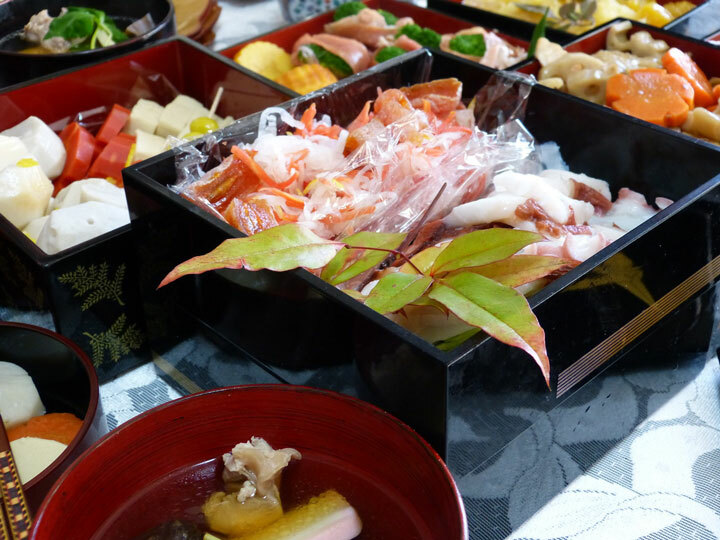 Osechi Ryori refers to the set of traditional Japanese food eaten on the very start of the New Year. It is often arranged and served in a layered bento box known as jubako. This 3 to 4 layered set is initially presented at the center of the table before New Year’s Day as an offering to the Toshigami-sama. After midnight, its contents are shared with friends or families. 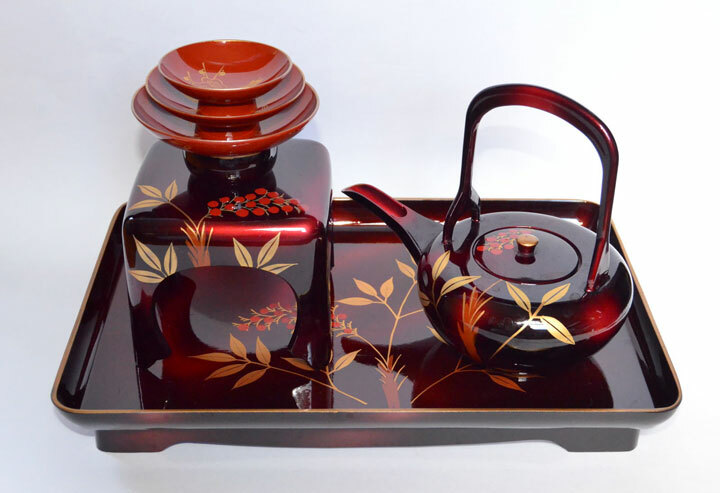 The tradition, itself, is called osechi and dates back to the Heian Period. Over time, several kinds of food have been added to the osechi ryori to represent various wishes. A common food item that can be found in the jubako is the renkon, a lotus root. The renkon symbolizes a pleasant future without any troubles. Iwai Bashi is a tool that goes hand in hand with the osechi ryori. Members who will be participating in the osechi will be given a special kind of chopsticks to eat with. Unlike the usual chopsticks that have one semi-pointed end, the iwai bashi has two. This is to provide the user with a side he can use, while the Toshigami-sama uses the other. As such, the initial side used by a person should be the only side he must continue to use until he is done eating, as not to disrespect the deity. Otoshidama refers to the tradition of grandparents, parents, or relatives giving monetary gifts to children. Kids of the Japanese community often look forward to this part of the New Year, as they receive small envelopes from 5 to 6 different people. Each envelope often contains an amount of 5,000 yen, on average, which increases in value as the children grow older. Originally, the tradition involved the Kagami mochi, which was given to children by parents every New Year and was called toshidama. Soon after, the rice cake was replaced with small toys and items, then finally with money. Hatsumode refers to the first visit to a temple or shrine for the year. This practice is observed by many families, usually from the 1st to 3rd days of January. 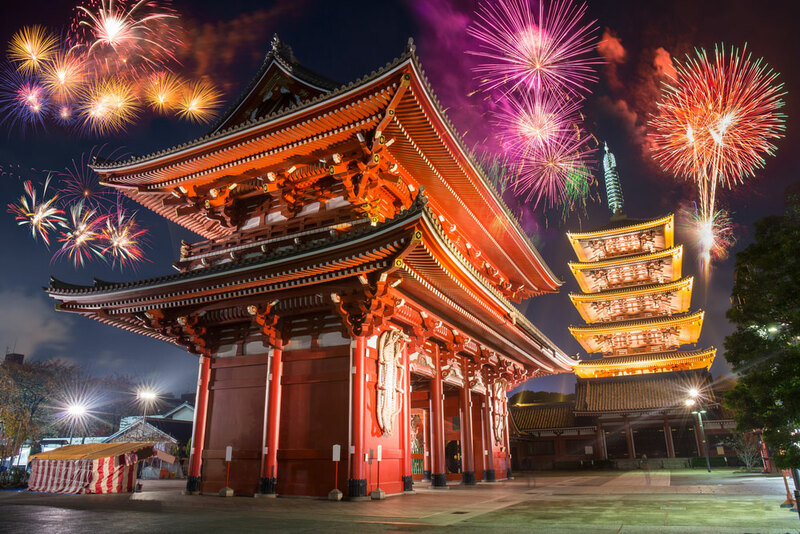 A lot of Japan’s temples and shrines have several festive attractions during this period including fortune telling, food stalls, and lucky charms (safety, love, wealth, health, good exam results) for visiting locals or foreign travelers. These places can get incredibly crowded, especially on January 1, but is an experience worth all the trouble. Just like the locals, tourists may make a prayer at the designated altar of the temple or shrine. As there is a specific prayer conduct followed in Japan, tourists are advised to initially watch how the locals pray. Typically, upon reaching the altar, one must throw in a few coins into the box located in front of it before ringing the bell. Afterward, two bows must be made, followed by two claps, then a final bow, which must be as deepest as possible. Otoso refers to the tradition of drinking sake on New Year’s Day. As such, the term is often confused to literally mean “New Year’s sake”. However, looking at the Japanese characters used for the word shows that it actually refers to the slaughter of a demon that used to attack and inflict terror on the villagers of Japan. Relating this to the drinking activity, it can be understood that the purpose of the tradition is to rid oneself of any evil spirits that may cause illness or troubles in the future. The tradition originates from China, where a certain kind of sake was used by the Tang dynasty for medicinal purposes. During the Heian Period, Japan’s nobility started observing the Chinese ritual every New Year. The practice was eventually introduced to the commoners by the Edo Period. The current way of doing otoso is to share the same set of special cups throughout the drinking celebration, as practiced by Japanese families. Otoso follows the order of youngest to oldest, to symbolize the vitality of the younger members of the group being absorbed by the older ones. Nengajo refers to a special postcard sent by the Japanese community to their friends or acquaintances before the year ends. It can be compared to the Western practice of sending out Christmas cards. Each card is usually delivered to the recipient by the post office on January 1. Usual greetings used in the postcards include the previously mentioned “Akemashite Omedeto Gozaimasu”, as well as “Kotoshi mo Yotoshiku Onegaishimasu”, which roughly means “Thank you for your support in advance”. Aside from these, nengajos also feature a family photo or a short message written by the sender explaining their condition and New Year resolutions. Aside from properly greeting one’s friends, nengajos also serve another purpose involving the lottery. Each postcard has a set of lottery numbers on it that provides the recipient with a chance to win various prizes including electronic devices and travel tickets. However, with the rising popularity of digital media, a big percentage of Japan’s youth considers sending out postcards to be an inconvenience. As such, there have been recently developed services that allow users to send and receive digital nengajos through email or through mobile apps. The sender may also include a video with his message. Fukubukuro, which means lucky bag, refers to the tradition observed by Japan’s department stores of filling bags with random items left over from the previous year and selling them at cheap prices. Its origin comes from the old Japanese saying, “Nokorimono ni wa fuku ga aru”, which roughly means that there is wealth in scraps. The discounts offered by shopping malls often fall within the range of 50-70%. As such, on New Year’s Day, Japan’s most famous stores like Shibuya 109 often have a long line of customers waiting outside even before they open. Shopping in Japan during shogatsu can get quite frantic, but it is one of the best times for shoppers to get the greatest deals. The emperor of Japan is known to only make several appearances throughout the year. Out of these instances, there are only two specific days when the Tokyo Imperial Palace opens its grounds to the public – January 2 and December 23. Every 2nd day of January, the Emperor and members of the family greet the crowd from the balcony behind a protective glass. They are scheduled to make five appearances throughout the day, at 10:10 AM, 11:00 AM, 11:50 AM, 1:30 PM, and 2:20 PM. The other day, December 23, is the birthday of the emperor. During New Year, the travel activities, both domestic and international, in Japan are quite hectic, with large groups of people visiting their friends and families. Tourists can expect to encounter congested airports, expressways, and trains from December 29 to January 4. Furthermore, a lot of establishments including restaurants, banks, stores, and ATMS are closed for more than a day during this period.